Central Java Police chief Insp. Gen. Noer Ali says Indonesia used 1,400 police personnel to secure the executions of the 8 non-violent drug offenders yesterday. This doesn't include military personnel who were also involved. 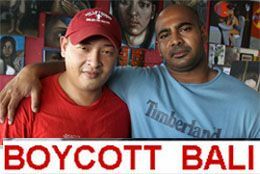 Bali 9 inmates Myuran Sukumaran and Andrew Chan have received their official notification that they will be executed imminently -- as soon as Tuesday. 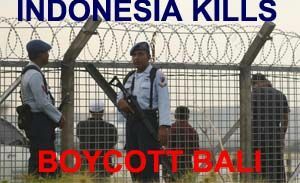 Indonesian law requires they be notified at least 72 hours before the killings. Another inmate waiting for her final appeal was also moved to the Death Island today, after the decision in her case was announced. Just another day in Paradise. 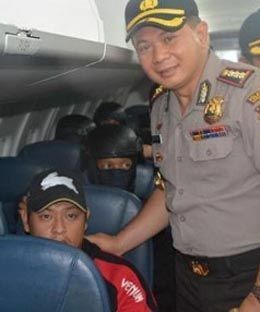 Escorted by two fighter jets carrying live missiles, commercial budget airline Wings Air, owned by Lion Air, today flew Bali Nine duo Andrew Chan and Myuran Sukumaran from Bali to Cilacap, where they were then taken by ferry to Nusakambangan, Indonesia’s death island where within days, they and 8 other convicted drug offenders will be driven at midnight to a killing field, tied to wooden posts and shot to death simultaneously. According to news reports, Andrew and Myuran were silent as they were led to an armored vehicle to be taken to the airport, but thanked the guards as they left for their treatment during the decade they spent at Bali's hellhole Kerobokan prison. Indonesia President Joko Widodo has rejected Austrialian Prime Minister Tony Abbott's plea for mercy for Andrew Chan and Myuran Sukumaran, which was made by telephone call earlier in the week. In an interview with daily business newspaper Kontan on Friday, the President reiterated that he would not commute the sentences imposed on drug traffickers as the country was in a state of emergency caused by drug abuse. He insisted that the executions of the convicts would go ahead as scheduled. On Thursday, the government had initially kept silent after Abbott issued his statement. 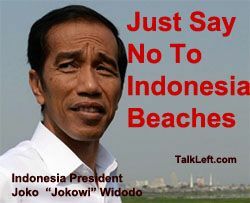 “Our position is clear: our laws cannot be interfered with,” the newspaper quoted Jokowi as saying. 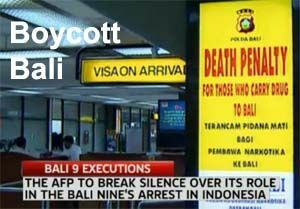 The social media campaign to boycott Bali as a result of its execution of non-violent drug traffickers is picking up steam. Ticket sales are down. 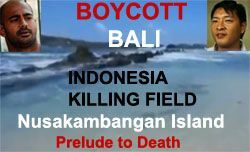 Within days, Myuran Sukumaran and Andrew Chan of the Bali Nine and 9 other drug traffickers will be flown to Nusakambangan Island, put in isolation cells, and within three days, taken to one of the island's two killing fields, tied to a wooden cross and shot. Indonesia President Joko Wikodo says there will be no delay in the executions of Bali Nine members Myuran Sukumaran and Andrew Chan. 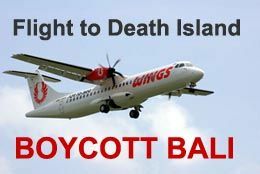 Hopes were raised earlier this week when their transfer to the Nusakambangan island prison was delayed.